The Children's Center, located on the Fort Steilacoom campus, is a model laboratory school specially designed with an expansive outdoor and indoor learning environment that provides many opportunities for children to grow physically,intellectually, emotionally and socially. The Center is staffed by Pierce College's Early Childhood Education professors and students. To earn an ECE degree, students complete one of their four practicums developing and applying professional skills with the children and families enrolled at the Center. Unique laboratory observation facilities provide further learning experiences for students and parents. The children's program includes developmentally appropriate activities in curriculum areas such as large and small motor skill development, music, science, dramatic play, art, literature, and math. The program emphasizes the value of play and hands-on experiences as children grow physically, intellectually, emotionally and socially. Children who are three years of age (toilet trained) by August 31 through six years of age (prior to entering kindergarten). 9:15 - 11:15 a.m., Mondays, Tuesdays, and Thursdays. $270 per child, per college quarter, or three payments of $90 each. A nonrefundable registration deposit of $90 is required upon notification of an opening. Instructors and second year students from the Early Childhood Education Program plan and present the children's program in the laboratory school setting. 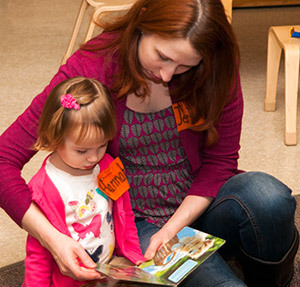 A parent education component is included in The Children's Center program. For more information or to enroll, please contact Chelsea Falk, 253-912-3670 or cfalk@pierce.ctc.edu. Calls for fall quarter waiting list will be accepted Sept. 1 to Feb. 15 of the year previous to the child's eligibility for enrollment. 7 weeks. Summer registration begins in March. Children and caregivers come to class together for 10 weeks at a time. 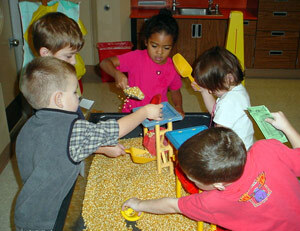 The children participate in hands on activities including learning songs, playing games, and creating art. Caregivers take turns being a classroom helper and participating in discussion concerning the development and parenting of young children. Children who are 18 through 36 months old. $66.50 per child and $28 tuition for a two credit pass/fail course for the adult, per quarter. A parent education instructor and an early childhood specialist plan and facilitate the program. Caregivers take turns helping the early childhood specialist with the children each week while the parent education instructor leads the discussion.